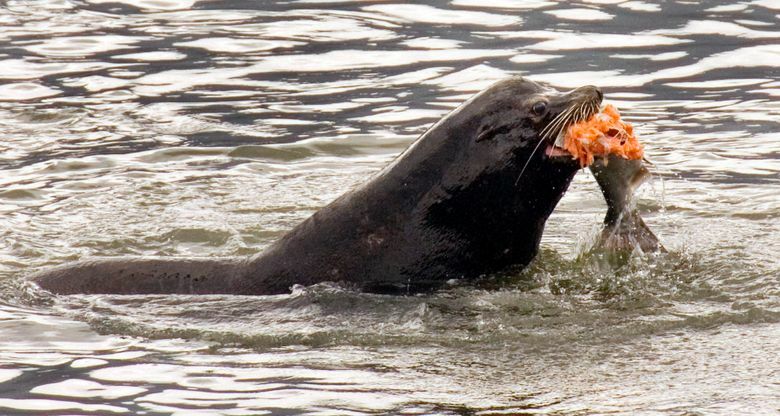 Apart from the contentious issue of dam removal, Congress must pass a bill to make it easier to kill some of the sea lions that are gorging on salmon and steelhead listed under the Endangered Species Act. Those who oppose the killing of sea lions that gobble up Northwest salmon are right about at least one thing: The marine mammals are not the only factors threatening the survival of our endangered fish. Yet these critics are wrong to suggest that breaching dams on the Lower Snake River could address the same problems as a separate plan to zero in on some of the predatory sea lions. Apart from the contentious issue of dam removal, Congress must pass a bill to make it easier to kill some of the sea lions that have moved further into the Columbia River Basin, where the animals are gorging on salmon and steelhead that are protected under the Endangered Species Act. Whether to take down the Snake River dams is a politically fraught debate with no resolution in sight. But aside from that, sea lion predation is rapidly endangering other fish runs that are struggling to survive — including at spots such as Oregon’s Willamette Falls, where the sea lions are a serious threat. “Taking out the dams on the Snake River is not going to affect the Willamette River population — that is not a Snake River dam problem, ” said Sara LaBorde, executive vice president of the Wild Salmon Center, which focuses on fish and river conservation. Her group supports breaching the four dams to open more salmon habitat, but also supports killing some of the roving sea lions, which state fish and wildlife officials say didn’t start traveling up the Columbia River in significant numbers until the 1980s. Part of the problem is that sea lions aren’t lining up to feast on fish solely at man-made structures such as dams, LaBorde said. Federal researchers estimated that a quarter of last year’s spring Chinook inexplicably disappeared on their way from the mouth of the Columbia River to Bonneville Dam, with sea lion predation most likely to blame. In 2014, the unexplained loss was about 45 percent. Those numbers are after accounting for losses from fishing. Meanwhile, as many as 40 sea lions at a time sometimes gather to prey on fish at Willamette Falls. Oregon wildlife officials warn that, unless something changes, there is a 90 percent chance that at least one of the river’s wild steelhead populations will go extinct. State and tribal officials in Washington and Oregon don’t think they’d have to kill many sea lions to make a difference. Only about 200 to 250 of the animals have learned to congregate in locations upriver where they can easily pick off salmon, said Shaun Clements, a research scientist for the Oregon Department of Fish and Wildlife. The goal is to take out those animals before others follow them to those same spots — a strategy research suggests could work. One study concluded that if select salmon-eating sea lions were removed early on, they would spread the behavior to fewer other animals, reducing the number of sea lions that would ultimately need to be killed. This targeted approach is different from broader culling efforts that try to lower the general population of a species, which research suggests has more mixed results. In any case, the California sea lion population is booming right now, having increased from 30,000 animals in the 1960s to nearly 300,000 today. Yet U.S. Sen. Maria Cantwell, D-Washington, is still taking heat for supporting a plan that would ease the road to killing even a small number of the animals. Right now, state and tribal officials can kill sea lions only in a limited area around Bonneville Dam, and only after a lengthy process of trapping them, marking them, observing them several more times and trying to scare them away. The bill Cantwell has co-sponsored would let wildlife managers bypass that process, so long as the animals are spotted far enough upstream in the Columbia River or in tributaries that serve as important spawning grounds. A permitting process and cap on annual killings would still apply. A nearly identical bill passed the U.S. House in June with the support of Washington’s entire delegation, including all six Democrats. Conflicts over dams will undoubtedly drag on. But Congress should not hesitate to take a simple step that could help save salmon now, even as other, longer-term conservation efforts get underway.